These handmade cards are made by Josephy Banda in Blantyre, Malawi. 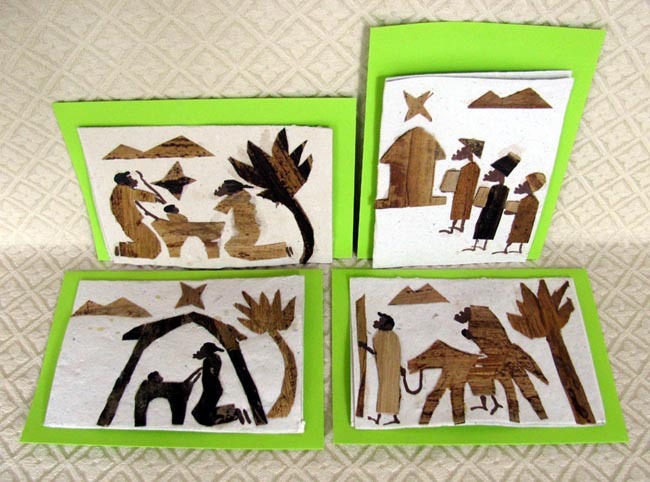 The coarse paper used in each card is handmade and then decorated with Nativity designs cut from the dried fiber of banana leaves. Each package of 4 cards includes one of each style shown in the example photo. Each card includes a lime green envelope (pictured). The inside of the card is blank. The cards measure 5.75 inches by 4 inches. We are so pleased to learn that Josephy was able to upgrade the roof on his home from grass to metal because we purchased a shipment of Nativity cards from him. Wonderful! This is a great blessing for his family. $8 for four. Please click here for purchasing instructions.